If you've got some mad art skills, or at least the ability to cut and paste, this contest is for you. 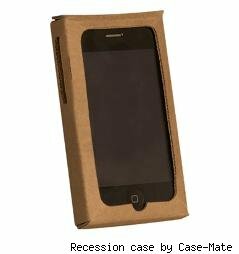 Case-mate, the makers of the cheapest (and perhaps ugliest) iPhone case the "Recession Case" is tempting customers and iPhone carriers to doodle their way into Recession Case history with the chance to win a Suzuki moped straight from the 1980s. Those who can't afford to cough up the 99 cents to buy their very own Recession Case, or artsy types who don't have an iPhone, can download the file to make their own. To check out the current entries and cast your vote (you can vote up to 10 times a day) visit the contest's gallery page. The contest runs until November 30th, so put your thinking caps on and get your colored pencils sharpened. And may the best Recession Case win!